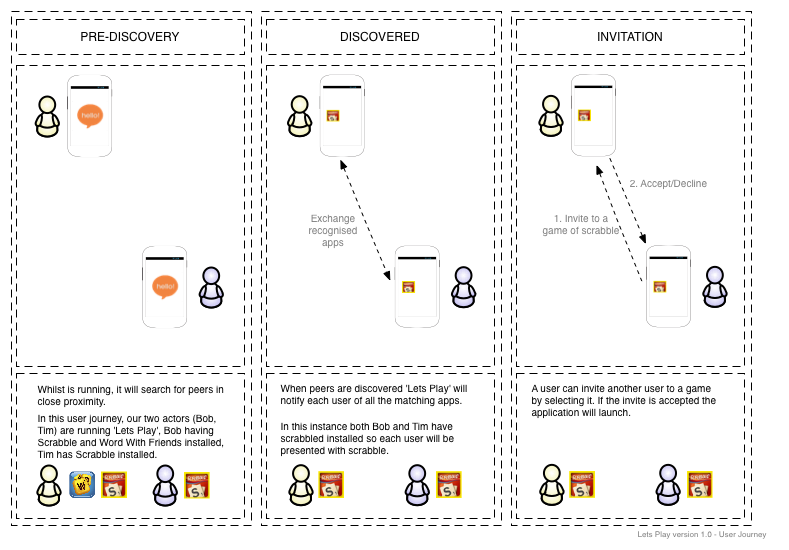 Inspired by this trend and the silence on the tubes we have decided to prototype something (working title) we like to call ‘Lets Play’ – the idea is that the service will run in the background of your smartphone looking for other ‘Lets Play’ peers. Once peers are found, each device will exchange their app catalog – (app catalog make up of apps that have been registered and support some form of proximity support e.g. multiplayer games via Bluetooth or Wifi). The users will be notified of all matching apps allowing them to engage in a game of scrabble whilst on their way to work. The prototype will be build for Android and use Samsungs Chord framework (to enter in the competition).